Ron Hogg, the Labour Party candidate for the upcoming police and crime commissioner (PCC) election on November 15th, met with student activists from the Durham University Labour Club last week. Mr Hogg used the opportunity to explain the role of the PCC and to field questions on issues such as potential privatisation and politicisation of the police force. He told the meeting that he would act responsibly if elected and would not unnecessarily raise fears about crime. Mr Hogg also pledged to protect the operational independence of the police and improve links with the public. Q. Why do you want to be a PCC? A. I’ve worked for all of my life in the public sector providing a service to our community and I see this as a real opportunity to use the skills that I’ve gathered in my thirty years of policing to give a further service to communities. I will help to re-engage them with the police and improve the service to them. Q. What do you think are the key crime issues in County Durham? A. I’ve been out campaigning and talking to people on their doorsteps and the main issues are around anti-social behaviour, around behaviour caused by drunkness and drug-taking etc. Those are the key things that cause uncertainty in our communities. And another thing which often comes up is speeding. These are the areas we need to work on and that’s what I’d want to develop in consultation with our communities. Q. What areas of Durham police provision would you like to see improved? A. I think we need to improve our service to victims and witnesses of crime. I know our force already does a tremendous amount on that but again what I’m picking up on the doorstep is that it isn’t quite what it should be. But what I find to be very positive is that when I pick up issues and feed them into the force they get back to me and they deal with them. So there’s a sign that the force is really committed to taking things forward which is very encouraging. Q. What is your philosophy on law and order and preventing crime? A. I think it has to be a mixed economy. If you commit a crime you have to accept there’ll be an element of punishment but, fundamentally, unless we allow criminals to be rehabilitated, unless we assist criminals to stop them from re-offending, then we’re never actually going to beat crime at all. So it’s about working with partners in and around the community to help those who would commit crime to move out of that chaotic lifestyle and to remove the drivers of crime. Q. So it’s tough on crime, tough on the causes of crime? A. Absolutely, and David Cameron appears to be getting the message at last. Information on all the candidates standing in the PCC election on November 15th can be found here. Students from Durham’s political societies have been campaigning with their local candidates ahead of the police and crime commissioner elections on November 15th. Members of the Durham University Conservative Association (DUCA) recently campaigned with the Tory candidate, Nick Varley, in Market Square, whilst also canvassing voters in nearby Ingelby Barwick. Meanwhile the Durham University Labour Club (DULC) has campaigning planned for the next month and will meet its candidate, Ron Hogg, at an event on Friday 26th October. The election for Durham’s police and crime commissioner (PCC) is just one of many being held across the UK which will see the creation of a new role in the community that is intended to make the police more accountable to the public. PCCs will aim to cut crime and deliver an efficient police service within the force area. They will also have powers to hire and dismiss the chief constable and set the forces budget. Also standing in the Durham election are Kingsley Smith, an independent, and Michael Costello, the UK Independence Party candidate. Daisy-Rose Srblin, Co-Chair of DULC, also spoke of the significance of the election. She said: “An awareness of any local political cause is an important step in understanding the issues of the residents with whom we share this city, and the election of Durham and Darlington’s first PCC, though not necessarily seeming to affect students directly, is no different. For more information on all the candidates click here. It’s a sad situation and it’s getting more and more absurd. Once infallible politicians the world over have suddenly become sullen-faced and are falling over themselves to say sorry. 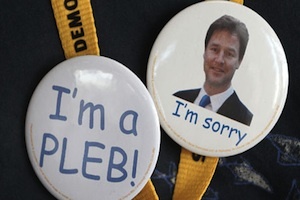 Nick Clegg is sorry. Todd Akin is sorry. Even Andrew Mitchell is kind of sorry. Mea culpa rings out across the public domain. Such a concert of apologies is rare because saying sorry in the alpha culture of 21st century public life is typically fraught with danger. Apologies invite accusations of incompetence, weakness or, worse, a spoof video. So it takes a brave politico to put their hand up and admit they got it wrong. There’s also the tricky business of the content of an apology. How to word it? Will it sound genuine? What about the tone? Get any of these things wrong and it can all blow up in your face. In this minefield of admitting wrongdoing I discern two different types of apology. First there is the relatively straightforward ‘personal’ apology, the admission of and repentance for a faux-pas that reflects badly on one’s own character. Bill Clinton is the founding father of this one, a man who will be forever remembered for his eventual admission of untoward relations with Monica Lewinsky. Delight in seeing the world’s most powerful man reduced to a groveling penitent. Andrew Mitchell’s ‘gate gate’ and Gordon Brown’s ‘bigot gate’ also fall into the category of the ‘personal’ apology, being expressions of contrition for an action that hints at a deeper character flaw. It was infidelity in the case of Clinton, disdain for his own police force in the case of Mitchell and a short temper/lack of respect/lack of humility (take your pick) in the case of Brown. I describe this ‘personal’ apology as straightforward because I think it’s the most essential; the culprit has no choice but to apologise. In an age of personality politics voters reject candidates they believe to be dishonest, rude or corrupt. Politicians know this and hence strive to present a squeaky clean image. When that image is tarnished they have no choice but to try to limit the damage. The press and the public would never forgive them if they didn’t. Second there’s the far more difficult and potentially dangerous apology: the ‘political’ apology. This involves saying sorry for a bad piece of policy or a poor political judgement. Clegg’s tuition fee promise apology falls squarely into this category. This is the apology politicians are most inclined to shy away from because it’s the one most likely to lead to accusations of being weak or incompetent, the two things you certainly can’t be in modern politics. In the case of Clegg the charge of incompetence has a ring of truth. What sensible political leader makes manifesto promises he knows he can’t keep? Coalition is the only route to power for the Lib Dems and Clegg should’ve been honest at the outset about the likely necessity of compromise. By pretending otherwise he set himself up for this fall. Also implicit in his apology is the admission of poor judgement, another blot on Clegg’s copybook. Politicians work hard to build reputations for making the right decisions at the right times. Saying you got it wrong damages this reputation. And then there’s this holier-than-thou video that also points to poor judgement. Could anyone really have been so naive? It’s almost painful to watch. Clegg’s critics have also pounced to accuse him of cynical electioneering, painting his apology as bereft of any real contrition and instead as a mere ploy to try to boost his party’s terrible poll ratings. Whether or not this is true is beside the point. The fact remains that Clegg’s enemies are only able to make such insinuations because he chose to say sorry in the first place. Given this maelstrom of negativity which can accompany the ‘political’ apology you can’t be surprised that most politicians shy away from saying sorry. But I’d prefer it if it didn’t work like this. I think the quality of our public discourse and interaction would improve if apologising wasn’t such a big deal. As a start, our politicians are human and, just like us, they are going to make mistakes from time to time. I’d much rather they came out honestly and admitted to them than cover them up just to maintain some unrealistic, macho, infallible image. Greater honesty and humility would strengthen trust with voters and act as a reminder that politicians are just people like you and me trying to do their job. Being more accepting of apologies would also encourage wider participation in politics. Who wants to work in a field where a single mistake is held against you for angry eternity and any apology is met with cynicism and criticism? If we want a good mix of people entering politics we have to be less cruel. But this will only work if the politicians apologise properly. They’ve got to say sorry immediately, with genuine contrition, and explain clearly what went wrong and why. Then, provided there’s been no malicious intent or gross misconduct, journalists and citizens alike should be ready to forgive and offer a second chance. Ultimately we’ve all got an interest in promoting the public good and coming down like a ton of bricks on those people who say sorry if they’ve made a mistake in pursuing that endeavour helps nobody. Sorry shouldn’t be the hardest word and we’d all stand to benefit if owning up wasn’t such a trauma.